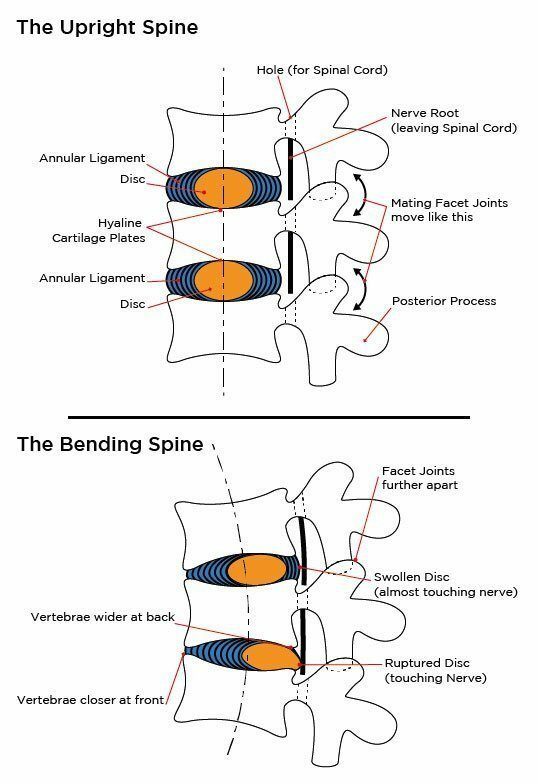 The spine is the ultimate piece of mechanical and electrical engineering. Just as a building stands on its foundations, the spine is the foundation of the body. Its skeletal bones are the building blocks of a vertical column. The spine goes one better than traditional vertical columns in that it is also flexible (tell that to the Romans!). Ligaments and discs represent the rubber and plastic buffers, protectors and connectors in a building. The spinal cord (the group of nerves) is the conductor – the electric wires and cables; so essential to all the electric powered facilities in a building. Colm Campbell, a chartered mechanical and electrical engineer was stricken with a ruptured disc in 1980. Luckily for back sufferers the world over, he could diagnose the cause of the engineering failure, tolerances overloaded, that had beset him. The sheer intensity of the pain he experienced focused him on finding a mechanical and electrical solution based on the exact mechanics and engineering of the spine. He discovered a solution that was simple, yet profound. “Pain occurs when something in the spine touches a nerve. 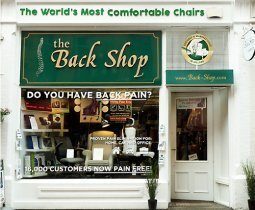 Pain is eliminated when that contact is broken.” Colm Campbell, Founder of The Back Shop. When the spine is in its perfect ‘S’ shape, there is no contact between nerves and any other part of the spine. Colm went on to invent chairs and products that gently keep spines in ‘S’ shape. Pain subsides and is eliminated. Colm began his work in the elimination of back pain following his recuperation in 1980. Since then his business has pioneered many breakthroughs in successful back-care products and to date has enabled over 16,000 people to live pain free. Constant research, knowledge building and fine tuning of products is at the heart of The Back Shop’s philosophy; always reverting back to the core principles of mechanical and electrical engineering and its application to the spine. Over fifty thousand people have presented with back problems at the Back Shop since 1980, each with a very individual spine and associated problem. Some were mild spinal issues, others were more serious and many were chronic. Working with each person individually has given us a depth of knowledge about the spine, its workings, its problems and its fixes. From a simple back support to a custom built chair, to a spinal supportive mattress, we have been able to diagnose the correct solution and get our customers out of pain. The Back Shop’s made to measure chairs ensure that the spine is always cosseted comfortably in perfect posture. In perfect posture (the ‘S’ shape) the spine is operating at optimum. The spinal cord is clear to conduct electrical impulses without interference. And the body can function unimpaired. Back Shop seating allows the spine to flourish and to be stronger throughout our lives. Associated products developed or sourced from worldwide markets by The Back Shop, are proven to keep the spine in top condition. Three Levels of Pain Prevention and Elimination. Our Spineline™, Postureline™ and Backline™ chairs deliver the full spectrum of back-care, depending on the requirements of customers. From fully made to measure to rugged lumbar supported 24-hour use chairs, our products are specialized to provide pain prevention and elimination in the home, office and car. Back Shop chairs work to eliminate pain in over 95% of cases. The remaining 4% to 5% of sufferers usually are in a chronic condition and require hospital intervention. Over 16,000 of our customers are now enjoying pain free lives. Please call into the shop to see our customer letters. We have hundreds of letters thanking us for chairs that have given new lives to people who were living with the most chronic of pain. Hundreds of very human stories are described in the letters, but only one outcome presides – freedom from back or neck pain and being able to live life to the full again. We have many letters of endorsement, encouragement and recommendation from some of Ireland’s foremost surgeons, doctors, matrons and nurses. This support is very welcome and shows us that our work is making a real difference in people’s lives. Osteopaths, physiotherapists, and chiropractors also refer patients to us. The World’s Most Comfortable (in the true sense of the word) Chairs! 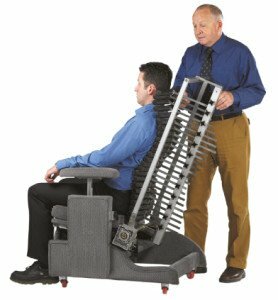 The Collins English Dictionary describes comfortable as, “at ease and free from physical pain.” Back Shop custom-built chairs are made to your exact measurements – height, weight, torso, leg and arm lengths, spinal curve and perfect posture degrees. Using the finest of hand made frames and upholstering in highest quality fabrics we deliver a chair that fits and supports you like no other. But there’s more to Back Shop chairs. It’s a unique philosophy, an unparalleled experience and a history of overcoming obstacles (isolating causes) that makes them so successful in eliminating back pain.